Not to be confused with Petronas. Petróleo Brasileiro S.A. — Petrobras, more commonly known as simply Petrobras (Portuguese pronunciation: [ˌpɛtɾoˈbɾas ]), is a semi-public Brazilian multinational corporation in the petroleum industry headquartered in Rio de Janeiro, Brazil. The company's name translates to Brazilian Petroleum Corporation — Petrobras. Petrobras controls significant oil and energy assets in 16 countries in Africa, North America, South America, Europe, and Asia. However, Brazil represented 92% of Petrobras' worldwide production in 2014 and accounted for 97% of Petrobras' worldwide reserves on 31 December 2014, when the company had 8,112.8 million barrels of oil equivalent (4.9633×1010 GJ) of proved developed reserves and 4,599.7 million barrels of oil equivalent (2.8140×1010 GJ) of proved undeveloped reserves in Brazil. Of these, 62.7% were located in the offshore Campos Basin. The largest growth prospect for the company is the Lula oil field in the Santos Basin. In 2015, the company produced 2.284 million barrels of oil equivalent (13,970,000 GJ) per day, of which 89% was petroleum and 11% was natural gas. Reserves held outside of Brazil accounted for 8.4% of production in 2014. The majority of these reserves are in South America; the company has assets in Argentina, Bolivia, Chile, Colombia, Venezuela, Paraguay, and Uruguay. Petrobras owns refineries in Texas (100,000 barrels per day of throughput), Okinawa, Japan (100,000 barrels per day of throughput), and Bahía Blanca, Argentina (30,000 barrels per day of throughput). The company also owns exploration blocks in the Gulf of Mexico and through joint ventures has production in Nigeria, Benin, Gabon, and Namibia. The Brazilian government directly owns 54% of Petrobras' common shares with voting rights, while the Brazilian Development Bank and Brazil's Sovereign Wealth Fund (Fundo Soberano) each control 5%, bringing the State's direct and indirect ownership to 64%. The privately held shares are traded on BM&F Bovespa, where they are part of the Ibovespa index. Petrobras is a major supporter of the arts in Brazil. Skyscraper hosting Petrobras' offices in Paulista Avenue, São Paulo. 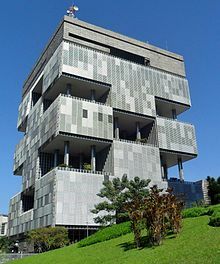 Petrobras was created in 1953 under the government of Brazilian president Getúlio Vargas with the slogan "The Oil is Ours" (Portuguese: "O petróleo é nosso"). It was given a legal monopoly in Brazil. In 1953, Brazil produced only 2,700 barrels of oil per day. In 1961, the company's REDUC refinery began operations near Rio de Janeiro, and in 1963, its Cenpes research center opened in Rio de Janeiro; it remains one of the world's largest centers dedicated to energy research. In 1967, the company established Petrobras Quimica S.A ("Petroquisa"), a subsidiary focused on petrochemicals and the conversion of naphtha into ethene. 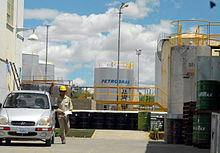 Petrobras had begun processing oil shale in 1953, developing the Petrosix technology for extracting oil from oil shale. It began using an industrial-size retort to process shale in the 1990s. In 2006, Petrobras said that their industrial retort had the capacity to process 260 tonnes/hour of oil shale. In 1994, Petrobras put the Petrobras 36, the world's largest oil platform, into service. It sank after an explosion in 2001 and was a complete loss. In 1997, the government approved Law N.9.478, which broke Petrobras's monopoly and allowed competition in Brazil's oilfields, and also created the national petroleum agency Agência Nacional do Petróleo, (ANP) responsible for the regulation and supervision of the petroleum industry, and the National Council of Energy Policies, a public agency responsible for developing public energy policy. In 1999, the National Petroleum Agency signed agreements with other companies, ending the company's monopoly. In 2000, Petrobras set a world record for oil exploration in deep waters, reaching a depth of 1,877 metres (6,158 ft) below sea level. In 2002, Petrobras acquired the Argentine company Perez Companc Energía (PECOM Energía S.A.) from the Perez Companc Family Group [es] and its family foundation for $1.18 billion. This acquisition included assets in Argentina, Brazil, Venezuela, Bolivia, Peru, and Ecuador, 1.1 billion barrels of crude oil reserves and production of 181 thousand barrels of oil equivalent (1,110,000 GJ) per day. In 2005, Petrobras announced a joint venture with Nippon Alcohol Hanbai to sell Brazilian ethanol to Japan, called Brazil-Japan Ethanol. On 21 April 2006, the company started production on the P-50 oil platform in the Albacora East field at Campos Basin, which made Brazil self-sufficient in oil production. By November 2015, the company had accumulated $128 billion in debt, 84% of it denominated in foreign currencies. In 1961, Petrobras geologist Walter K. Link published Link's memorandum, which implied that the company was better off exploring offshore instead of onshore. 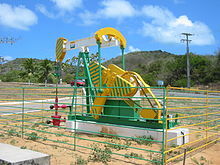 In 1963, Petrobras discovered the Recôncavo baiano [pt] and Carmópolis oil fields. The company's growth was halted by the 1973 oil crisis. The entire country was affected, and the "Brazilian miracle", a period when annual GDP growth exceeded 10%, ended. Petrobras nearly went bankrupt. In 1974, the company discovered an oil field in the Campos Basin. This discovery boosted its finances and helped it restructure nationwide. In 1975, the Brazilian Government temporarily allowed foreign operators into Brazil, and Petrobras signed exploration contracts with foreign companies for oilfields in Brazil. The company was affected by the 1979 energy crisis, although not nearly as badly as in 1973. In 1997, Petrobras reached the production milestone of 1 million barrels (160,000 m3) per day. The company also executed agreements with other Latin American governments and began operations outside Brazil. In 2003, on its 50-year anniversary, Petrobras surpassed 2 million barrels of oil equivalent (12,000,000 GJ) of daily production. On 1 May 2006, after the Bolivian gas conflict, Bolivia's president Evo Morales announced the nationalization of all gas and oil fields in the country and ordered the occupation of all fields by the Bolivian Army. On 4 May 2006, Petrobras cancelled a major future investment plan in Bolivia as a result. The Bolivian government demanded an increase in royalty payments from foreign petroleum companies to 82%, but eventually settled for a 50% royalty interest. In 2007, Petrobras inaugurated the Petrobras 52 Oil Platform. The 52 is the biggest Brazilian oil platform and the third-biggest in the world. In 2007 and 2008, Petrobras made several major oil discoveries including the Lula oil field (formerly known as the Tupi field), the Jupiter field, and the Sugar Loaf field, all in the Santos Basin, 300 km off the coast of Rio de Janeiro. The oil fields were discovered by partnerships that include Petrobras, Royal Dutch Shell, and Galp Energia. However, estimates for the reserves of these new fields varied widely. The P-51 Platform, the first semisubmersible platform built entirely in Brazil, capable of producing up to 180,000 barrels of oil per day, started production in the Campos Basin in January 2009, and in February 2009, China agreed to loan Petrobras US$10 billion in exchange for a supply of 60,000-100,000 barrels of oil per day to a subsidiary of Sinopec and 40,000-60,000 barrels of oil per day to PetroChina. In August 2009, Petrobras acquired ExxonMobil's Esso assets in Chile for US$400 million. In September 2010, Petrobras completed a US$70 billion share offering, the largest share offering in history, to be used to develop newly discovered oil fields. In July 2013, a worker strike action shut down production at several of the company's oil platforms. In September 2013, Petrobras sold eleven onshore exploration and production blocks in Colombia to Perenco for US$380 million. In September 2013 Organizações Globo reported on national televisionthat the US government had been spying on Petrobras. This information was reportedly provided by US journalist Glenn Greenwald. Petrobras announced that it was investing R$21 billion over five years to improve its data security. In 2014, the company sold its assets in Peru to PetroChina for US$2.6 billion. Also in 2014, Petrobras set a new company record for average daily production of 2.863 million barrels of oil equivalent (17,520,000 GJ). In 2014, the largest corruption scandal in the history of Brazil was uncovered centered around Petrobras. Initially the investigation was not focused on Petrobras executives but rather small time doleiros black market money dealers. These money launderers tended to use small business to carry out their business but the investigation discovered links to an executive at Petrobras, Paulo Roberto Costa, the director of refining and supply. President Dilma Rousseff made one critical change in policy, the introduction of plea bargains, making it possible to offer deals in exchange for information leading to further arrests. It was a defining moment of the investigation. Costa later confessed that he and his colleagues had knowingly overpaid on contracts, funneling excess funds to personal accounts. Paulo Costa received kickbacks of 3% on all contacts. According to the investigation, a small number of top Petrobras officials colluded with an organized cartel of 16 companies to overcharge Petrobras for construction and service work in return for bribes and kickbacks. Petrobras officials pegged the total of all bribes at nearly $3 billion. As of August 2015, 117 indictments had been issued, five politicians arrested, and criminal cases brought against 13 companies. Both Dilma Rousseff, who promised to cut corruption in her election campaign, and former Brazilian president Luiz Inácio Lula da Silva served on the board of directors of Petrobras during the scandals and both were blamed, as well as the president of the lower house, Eduardo Cunha. Cunha was sentenced in March 2017 to 15 years in prison. Lula was implicated in multiple corruption investigations. Protests broke out calling for the resignation or impeachment of Rousseff. The most widespread of these occurred on 13 March 2016 in over 300 municipalities. Police estimates gave about 3.5 million protestors throughout the country. Some of the protests were in areas previously thought of as strongholds of the Workers Party, of which Rousseff was the leader. The Bill and Melinda Gates Foundation sued Petrobras and its auditors, PriceWaterhouseCoopers as a result of the corruption scandal. Later in September 2018, Petrobras agreed to pay $853.2 million as a settlement. Petrobras's website notes several initiatives to preserve the environment. These include efforts to support both ocean and forest ecosystems. Most notably, Petrobras has sponsored population studies and conservation efforts for humpback whales in northeast Brazil. The company's efforts helped to rebuild Brazil's humpback whale populations from 2,000 in the mid-nineties to over 9,000 in 2008. Petrobras subscribes to the United Nations Global Compact, a voluntary agreement regarding human rights, working conditions, corruption, and the environment. In 2008, the Spanish consultancy firm Management and Excellence named Petrobras the world's most sustainable oil company. In the Speed Racer live-action movie, one of the cars featured is the "Green Energy", a biodiesel-fueled racing car sponsored by Petrobras. Petrobras sponsors the Brazilian Série A.
Petrobras was a secondary sponsor for the AT&T WilliamsF1 Team from 1998 to 2008 and signed again with Williams F1 from 2014 onwards. From 2018, Petrobras left Williams and joined allegiance with McLaren. Petrobras sponsored the Clube de Regatas do Flamengo in Brazil from 1984 to 2009. ^ a b c d e f g h i j k l m n o p q "pbraform20f_2014.htm - Generated by SEC Publisher for SEC Filing". Retrieved 5 May 2016. ^ Brazilian government boosting Petrobras stake to 64 percent Archived 30 May 2012 at Archive.today France 24. Retrieved on 2010-10-15. ^ Petrobras. "Profile". About Us. Retrieved 19 May 2018. ^ Gaspetro "List of Subsidiaries". Retrieved 5 May 2016. ^ "Petroleo Brasileiro- Petrobras Revenue 2006-2018 | PBR". Retrieved 2018-10-22. ^ "Fostering Culture: We encourage the Arts and Culture - Petrobras". Petrobras. Retrieved 5 May 2016. ^ Bello (14 February 2015). "Whose oil in Brazil?". The Economist. ^ a b Peter Muello (21 April 2006). "New Rig Brings Brazil Oil Self-Sufficiency". Washington Post. Associated Press. ^ Diana Kinch (26 December 2011). "Petrobras halts some Reduc refinery ops after fire". Marketwatch.com. ^ "Press Tour to the Petrobras Research and Development Center (Cenpes) on Monday, 30 June". Brazilian Government. 24 June 2014. ^ "Petrobras P-36". Retrieved 5 May 2016. ^ a b Andréa Novais (24 November 2011). "Understand Petrobras". The Brazil Business. ^ "Monopoly ends for Brazil's Petrobras". Offshore Magazine. 1 November 1999. ^ Jonathan Wheatley (18 December 2000). "Pumping Up Petrobras". Bloomberg L.P.
^ "Petrobras to acquire control of Perez Companc". Oil and Gas Journal. 29 July 2002. ^ Ative Soluções. "Japan - Petrobras". Retrieved 5 May 2016. ^ "Petrobras's Dangerous Debt Math: $24 Billion Owed in 24 Months". Bloomberg L.P. 18 November 2015. ^ Dott, Robert (2001). "From the Archivists Corner - Linkages" (PDF). The Outcrop: 14–17. ^ "The Alignment Factor". Retrieved 5 May 2016. ^ "Campos Basin". Petrobras. Retrieved 5 May 2016. ^ James Brooke (7 November 1994). "U.S. Oil and Gas Companies Test Waters in Brazil, Again". New York Times. ^ a b "Now 50, Petrobras, the Brazilian National Oil Company, Has Aged Well". Wharton School of the University of Pennsylvania. 8 October 2003. ^ Christine Hauser (1 May 2006). "Bolivia Nationalizes Natural Gas Industry". New York Times. ^ "Petrobras scraps Bolivia project". BBC. 4 May 2006. ^ "A hard bargain: Evo Morales deals and wins on gas". The Economist. 2 November 2006. ^ "Petrobras starts production tests at P-52 platform". Oil and Gas Journal. 26 November 2007. ^ "The next oil giant?". The Economist. 19 March 2009. ^ "Petrobras' P-51 Kicks Off Production in the Campos Basin". RigZone. 26 January 2009. ^ Jonathan Wheatley (19 February 2009). "Brazil to supply oil to China for loans". Financial Times. Archived from the original on 11 July 2015. ^ Fábio Palmigiani (8 August 2008). "Petrobras to acquire Esso assets in Chile for US$400mn". BN Americas. ^ Peter Millard (24 September 2010). "Petrobras Raises $70 Billion as Investors See Growth". Bloomberg L.P.
^ "Brazilian oil giant Petrobras dumps NZ exploration permits". New Zealand Herald. 4 December 2012. ^ "Petrobras Workers Strike, Shut Down Some Oil Platforms". Forbes Magazine. 25 July 2013. ^ Asher Levine (8 September 2013). "U.S. government spied on Brazil's Petrobras oil firm". Reuters. ^ Leahy, Joe (18 September 2013). "Brazil's Petrobras to invest heavily in data security". Financial Times. ^ Chen Aizhu and Judy Hua and Anthony Boadle (13 November 2013). "Petrobras sells Peru unit to PetroChina/CNPC for $2.6 billion". Reuters. ^ "Petrobras hits 'historical' production record". Offshore Energy Today. 13 January 2015. ^ "Brazil ex-speaker Eduardo Cunha jailed for 15 years". BBC. 30 March 2017. Retrieved April 28, 2017. ^ Brad Brooks (10 October 2016). "Lula charged over Odebrecht Angola work in Brazil graft probe". Reuters. Retrieved 28 April 2017. ^ "Manifestantes fazem maior protesto nacional contra o governo Dilma" (in Portuguese). O Globo. 13 March 2016. ^ "Bill Gates sues oil giant Petrobras and PwC over corruption scandal". The Telegraph. 25 September 2015. ^ Viswanatha, Aruna; Lewis, Jeffrey T.; Rubenfeld, Samuel (2018-09-27). "Petrobras to Pay $853.2 Million to Settle Corruption Probes in U.S., Brazil". Wall Street Journal. ISSN 0099-9660. Retrieved 2018-09-28. ^ "Mapping to preserve". Retrieved 5 May 2016. ^ "Petroleo Brasileiro SA - Petrobras – 2015 Communication on Progress - UN Global Compact". Retrieved 5 May 2016. ^ "Petrobras is the most sustainable oil company". T&B Petroleum. 22 February 2008. Archived from the original on 5 April 2016. 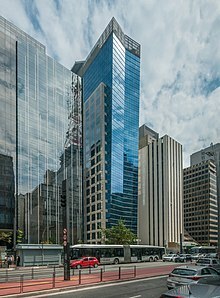 Wikimedia Commons has media related to Petrobras.